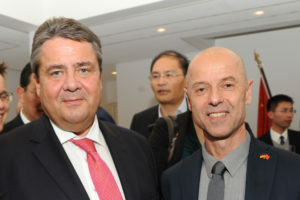 Peking, November 3, 2016 – Roughly six months after Wolfgang Frey participated in the Sino-German Forum in Peking with German Federal Chancellor Dr. Angela Merkel and the Chinese Federal Minister Li Keqiang, Wolfgang Frey accompanied German Federal Minister for Economic Affairs Sigmar Gabriel along with a distinguished trade delegation to the Middle Kingdom. Prior to his departure, Chancellor candidate Sigmar Gabriel was able to announce a breakthrough in the Tengelmann settlement. Now the Minister for Economic Affairs would like to align Sino-German economic cooperation even under the current difficult conditions. The China trip began on November 1, 2016 with Wolfgang Frey talking to Dr. Roland Busch, board member of the Siemens AG, about his work on the Smart Green Tower. As with the Siemens Head Joe Käser in his conversation with Wolfgang Frey, Dr. Roland Busch also showed his support and recognition for this unique energy concept that has been developed in partnership with Siemens AG, Fraunhofer Institute and Frey Architekten. The first Smart Green Tower will start construction in spring 2017 as a flagship project and prototype in Freiburg. 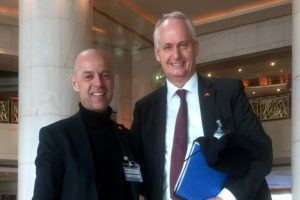 Because understanding various mentalities is at the heart of Wolfgang Frey’s principles for sustainability, his conversation the following day with Hubertus Troska, board member of the Daimler AG and responsible for the Chinese market, was of great importance. Contrary to Sigmar Gabriel’s criticism about Chinese economic policy, Daimler Head Dieter Zetsche expressed a positive view and mentioned the possibilities the Chinese market can offer. These differing opinions and viewpoints provide Wolfgang Frey a solid basis for his work in social, economic and environmental sustainability.